Larry tells us: "While world leaders met behind closed doors for the NATO summit, the throng of protesters flooded the streets to air grievances about a wide range of complaints from war to climate change. 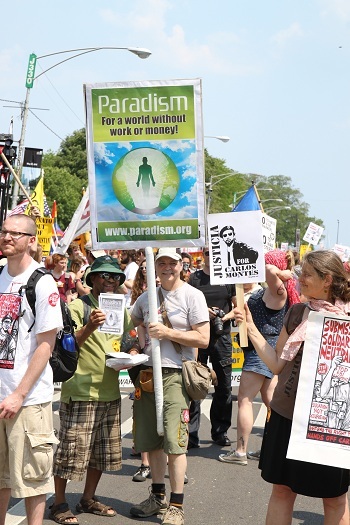 During the march down Michigan Avenue, they chanted, sang songs, and shouted a variety of slogans against wars, economic mismanagement, and the waste of valuable resources just to name a few. At the end, nearly 40 young veterans dramatically disowned their service medals and some symbolically hurled them in the direction of McCormick Place where world leaders were meeting. We walked around through the mass of humanity, happy to be able to give people hope for a paradisical future."